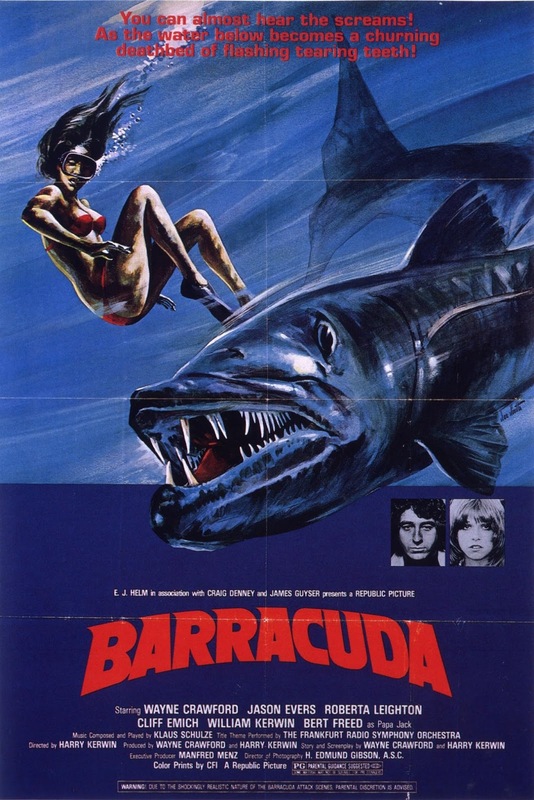 The movie begins with a Barracuda attack. It's savage, but also a little silly. The movie is only rated PG, so there are limits to how much carnage you're going to get here. After the obligatory initial attack, we meet Mike Canfield (Wayne Crawford, who also co-wrote the script, produced, and filmed the underwater scenes), a marine biologist who is taking water samples in order to learn how much pollution the Jack Chemical Company is dumping into the ocean. The head of the company, Papa Jack (veteran TV actor Bert Freed) isn't happy that some uppity biologist is snooping around his beach. After sending out his personal guards to round up Canfield and his students, one of the guards gets a little too aggressive and a fight ensues. When Sheriff Williams (William Kerwin) arrives to arrest Canfield, he's actually pleased that someone has been giving Papa Jack some trouble. It seems there's been lots of trouble in town lately--people randomly fighting, mysterious men roaming around, and some strange barracuda attacks. After introducing Canfield to his daughter Liza (Roberta Leighton), Sheriff Williams pretty much teams up with Canfield to figure out what's going on in town. I don't want to tell you any more, because I want you to experience Barracuda for yourself.  While it's got some really hokey parts to it, and some questionable acting, at the heart of the film is an interesting mystery story that is fairly unexpected. If you begin watching this movie and claim the plot is too predictable, you're either psychic (congratulations, by the way) or you're Wayne Crawford. 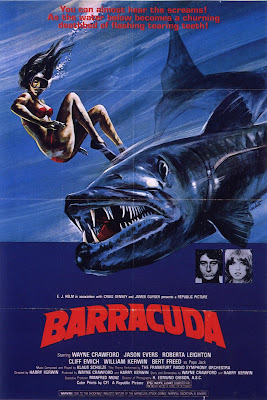 It's a perfect blend of ocean horror and 1970's conspiracy, and while lighter on barracuda attacks than you might expect, there's plenty of other goodness to make up for it. I'm not going to delve too deep into a film that doesn't even have a Wikipedia entry (at least not yet...). In brief, this film has the following traits that make it worth watching: underwater fish attacks, people finding dead bodies, hot 70s girls, a crazy patriarchal despot, a gross dinner scene, shady secret agents, government conspiracies, and pseudoscience. Overall, Barracuda gets a Good and a half from me. I went in expecting complete and utter trash (actually, I was hoping for complete and utter trash), and was pleasantly surprised by the film. It's like the Little Engine that Could of Jaws ripoffs. You're probably not going to develop a fear of barracudas after watching this film, but it might be a fun addition to your Halloween viewing list if you're looking for something different from serial killers, hauntings, and possessed dolls.